In 1987, an environmentalist by the name of Craig Quirolo decided to form an organization dedicated to protecting the fragile coral reef ecosystems, especially the ones near the island of Key West, Florida. Down in South Florida all the way through the keys and out to the Dry Tortugas lies one of the longest stretches of coral reef in North America. The coral reef system is a delicate and nutrient-poor area that allows for the growth of the skeletal-like coral formations. This area, though low in nutrients, is able to house a fascinating plethora of animal and plant species, creating a unique and colorful ecosystem complete with turtles, lobster, tropical fish, starfish, sponges, and much more. 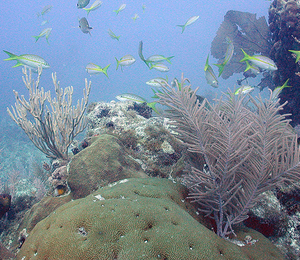 We can protect the coral reef ecosystems in a variety of ways. Over the past twenty years, Reef Relief has succeeded in a number of protection and preservation efforts. The Key West Reef Mooring Buoy Program, for instance, was a project that aimed to maintain the 116 mooring buoys that are found throughout six different locations of the Key West coral reef area. The buoys would protect the reefs from the large charter boats that pass over the area daily. A more complicated project was the Clean Water Campaign which aimed to join forces with the Florida Keys National Marine Sanctuary and the Water Quality Protection Program to keep the waters of Key West and the rest of South Florida as clean and pristine as possible. This effort helped launch the No Discharge Zone which prevents boats from leaving their waste and sewage out on the oceans. Reef Relief also develops educational programs such as the Coral Reef Conservation Program. This program aims to spread knowledge of coral reef protection methods as well as how individuals can take a role in the preservation of the reef environment. This includes maintaining the Environmental Center in Key West, the Discover Coral Reefs School Program, and summer camp called Coral Camp. If you are out on the Dry Tortugas or Key West and you snorkel or dive above the coral reef, you will understand what an amazing and unique natural habitat it is. It is efforts like those of Reef Relief that will allow these habitats to live on for generations to come, both for humans to explore and understand the richness and complexity of nature and for the hundreds of sea species that make their home in the reefs.